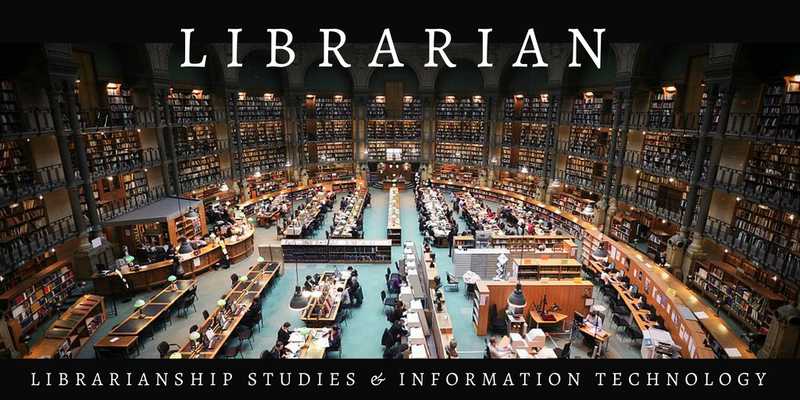 Librarianship Studies & Information Technology is a blog of Library and Information Science. It is one of the best rewarding and internationally acclaimed blogs for the Libraries, Librarians, Catalogers, Information Scientists, LIS Faculty, and research scholars. Whether you are a student, a researcher, or a working professional, this place is for you, absolutely free forever. The blog aims to provide a world-class education in library and information sciences globally. Definition of a Librarian and 11 Excellent Infographics About The Librarian highlighting their duties, functions, roles, responsibilities, worth, and importance, with interesting facts and figures. A librarian is a person who is in charge of or works professionally in a library and is responsible for its management and services. The librarian takes care of the library and its resources. Typical job of a librarian includes managing collection development and acquisitions, cataloging, collections management, circulation, and providing a range of services, such as reference, information, instruction, and training services, etc. Librarians are trained in library and information science and are engaged in providing library services, usually holding a degree in library science. In the United States, the title Librarian is reserved for persons who have been awarded the ALA-accredited Master of Library and Information Science or MLIS degree or certified as professionals by a state agency. In a small library, such as a school library a single librarian may be responsible for managing the overall functions of the library but big libraries, such as a large academic library may have much staff to carry out different functions of the library depending on their qualifications, expertise, and functional specializations, e.g. acquisition librarian, archivists, cataloging librarian, electronic resources librarian, metadata librarian, reference librarian, serials librarian, systems librarian, etc. Based on the type of the library served, librarians may be classified as a school librarian, academic librarian, special librarian, etc. The increasing role of technology in libraries has a significant impact on the changing roles of librarians. 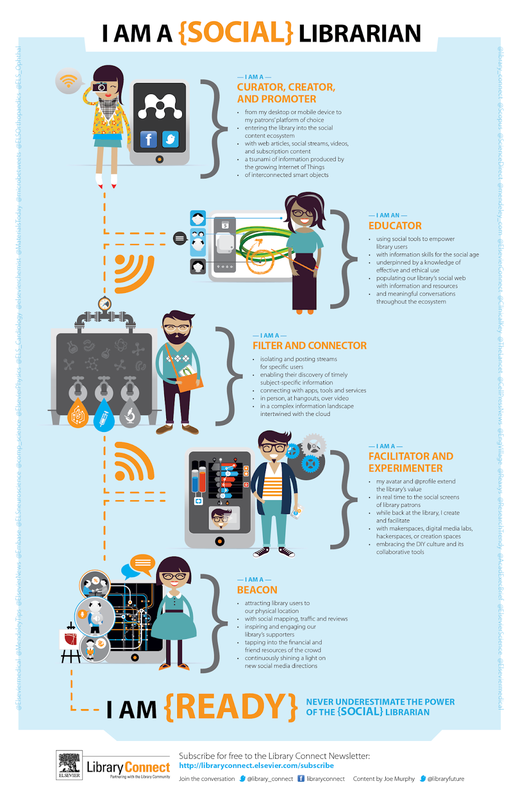 A 21st-century librarian is required to be very much updated of technological changes. New age librarians are making greater use of emerging technologies in the library management and services to make it more popular and useful among the patrons. New age librarians are not mere bookworms, they are high-tech information professionals, and clever communicators, helping patrons dive in the oceans of information available in books and digital records. Librarians are regular people who have interests in all sorts of different thing. Strong libraries build strong students and it is the librarian who actually manages the functions and services of the library. In an academic setup students' performance improves significantly with high librarian collaboration. A modern librarian may deal with the provision of acquisition, maintenance, and dissemination of information in many formats, viz. books, ebooks, serials, sound recordings, moving images, video recordings, manuscripts, cartographic materials, computer files, photographs and other graphic materials, databases, and digital resources, etc. Collection Development and Acquisitions: Selection and ordering of resource according to the collection development policy of the library and evaluating needs of patrons, receiving resources, paying invoices, managing acquisitions of resources through purchase, subscription, license, gifts, and donations, and weeding out unrequired items. Cataloging and Metadata: Descriptive cataloging, subject cataloging, and authority control, that will enable discovery of library resources online, providing metadata for digital resources. Collections Management: Stamping the resources indicating the ownership of the library, pasting due date slip for circulation, affixing call number label, barcode, and putting RFID tags, preservation, repair, etc. Library Circulation: Loan function of lending library materials. Library Circulation includes checking out library materials to library users, renewing the borrowed items, reserving checked out items for the patron, checking in materials returned, checking the materials for damage at the time of return, if found damaged then giving that to responsible staff for repair and when repair is not possible then replacement, renewal of materials, receiving payment of fines for damaged and overdue materials and payment for subscription to the library and other charges, maintaining order in the stacks by re-shelving the library materials by call number given by classification system, such as Library of Congress Classification (LCC) or Dewey Decimal Classification (DDC) system. Digital Resources Management: Providing and maintaining access to licensed electronic resources. Digitizing collections for online access and maintenance of electronic resource and databases. 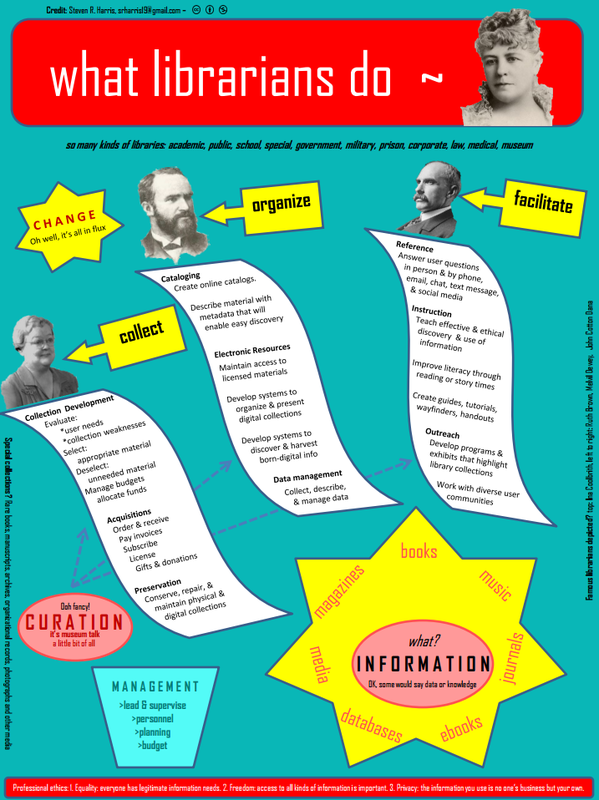 Develop systems to organize & present digital collections. Develop systems to discover & harvest born-digital information. The rising popularity of digital archives, web-based content creation, and electronic media has shifted the way communities use libraries in the 21st century. Excessive reliance on computers have made the role of a librarian more relevant and important. The traditional librarian was a custodian responsible for selecting and caring for physical materials but today's librarian works also a digital custodian, providing access to electronic as well as physical materials, maintaining specialized knowledge of digital databases, and evaluating electronic materials and acquiring licenses. Reference and Information Services: Making reading suggestions and recommendations to library patrons. Answering questions by the users in person, on the phone, by e-mail, online chat, text messages, and on social media such as through a Facebook Page. Going through too many resources, in order to pick up the most valuable ones is one of the skills the patrons could learn with a help of a librarian. Librarians assist patrons with research and locating library materials on-site and in specialized electronic resources. Instruction Services: Providing instructions and teachings in effective discovery & use of information. In times of the internet, what we mostly struggle with is the information overload, not a lack of it. Today's students are tech-savvy, but they don't know how to find required information and they need instruction and guidance. Creating guides, tutorials, handouts for effective use of library materials. The traditional librarian was a guide, assisting users in finding relevant materials. Today's librarian is a digital guide, educating patrons about the use of digital library services and generalized digital literacy, providing virtual service to users, often through library websites. Outreach Services: Develop programs & exhibits that highlight library collections. Work with diverse user communities. Coordinating programs such as storytelling for children, information literacy or health information, reading clubs, a book talk, etc. The traditional librarian was a PR officer, maintaining connections with community institutions and other libraries. Today's librarian is a digital PR officer, developing relationships with database managers, electronic publishers, etc., hosting community events, partnering with other libraries to increase access to materials. Personnel Management: Leading, training, and supervising library staff. Library Planning: Planning a new library or planning for the organization and services of an established library. Financial Management: Managing finance aspects and allocation of budgets. In a survey, it is found that 75 percent of all the librarians are between the age group of 25-55. Job opportunities are on the positive side as a large number of trained librarians will be required to fill the positions. Librarians are teachers, problem solvers, innovators, collaborators, leaders, and learners. Note: If you are seeing this on a mobile device then switch to web version as some infographics are not visible in the mobile version of this blog page. Help us improve this article! Contact us with your feedback. Sally C. Tseng (Former Librarian, University of California, Irvine United States, e-mail in AUTOCAT) - Hello Salman, Thank you very much for sharing these informative links. Your time and hard work are a real contribution to librarianship! N V Sathyanarayana (CMD, Informatics (India) Ltd. in LinkedIn Group Special Libraries Association) -- Congratulations! Salman for your valuable and painstaking compilation. I went through your blog. It is both fun and rewarding to browse. I enjoyed browsing through your blog assimilating interesting facts about the world of librarianship that is struggling to evolve as Information Science in a new and fast changing competitive world of ICT. Sally Robertson (Librarian at Nashville State Community College, Greater Nashville Area, TN, United States) - Great article. I love my career as a librarian. How is Attribute defined in FRBR model? All data and information provided on Librarianship Studies & Information Technology blog are for informational purposes only. 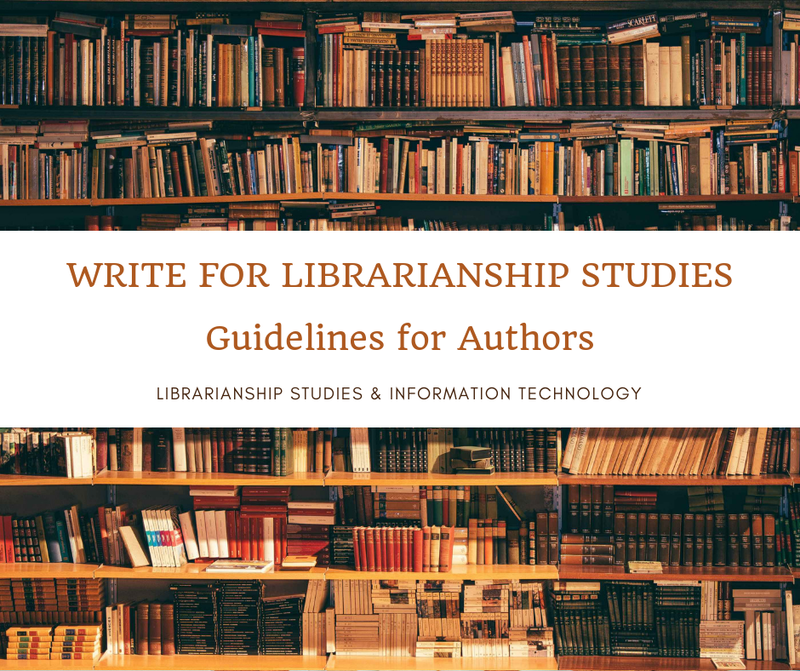 Librarianship Studies & Information Technology Blog makes every effort to ensure but does not guarantee, the accuracy of the information on its website. Hyperlinks to other web sites imply neither responsibility for, nor approval of, the information contained in those other websites on the part of this blog. It is a personal blog, the opinions expressed in Librarianship Studies & Information Technology Blog represent my own and not those of my employer.